Quick question. Once you Press the pressure cook button and set the timer to 12 minutes, the IP says “on”. Your instructions say to cook the lentils for 12 minutes. Does this mean 12 minutes from the time that the IP says on? Does this freeze well? It looks yummy! Hi Stefanie, yep, it freezes perfectly! Delicious! I used green lentils and it came out perfect. Thank you! This recipe is awesome and delicious! I have tried the exact recipe in the Instapot AND traditional stove top pressure cooker. It turned out great both times! My family loves it especially my almost 2-year old girl. I do recommend to ADD BABY spinach at the end.. it definitely enhances the flavour and adds that mild sweetness!! Awesome recipe and thank you for sharing <3!! I’m so glad your family likes it – and happy to know it works in a stove-top pressure cooker too! 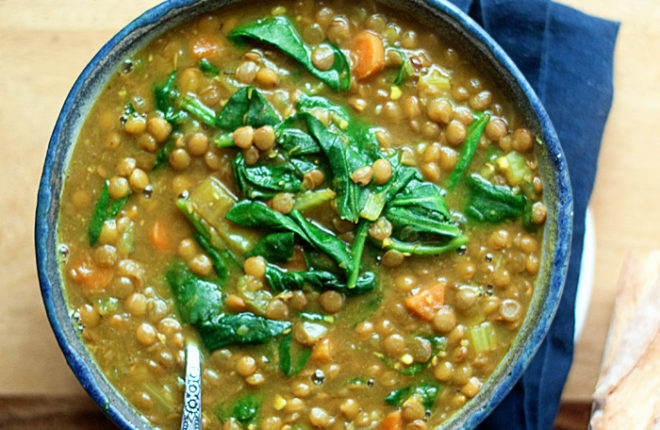 Can you use green lentils instead of brown? Yes – if they are French Green lentils, I’d suggest adding about 10 minutes on to the cooking time. Thanks for this recipe! I made it last night to rave reviews. I added a sweet potato (my kids love anything with sweet potatoes) and had to cook it for an extra 5 minutes as the lentils were still a little crunchy (probably had to do with the lentils I had, not the recipe). It was just what we needed to warm us on a frigid winter night! I have a Crock Pot Express which does not have a “manual” button. Which setting would you suggest using instead? Meat maybe or soup?? I just used the soup button and adjusted the time, on my Crock Pot Express, it worked fine. But the instructions say,”select Beans/Chili and adjust the pressure and cook time as desired. I also added red and orange sweet peppers. I just made this tonight and it was sooooooo tasty! I doubled the recipe and the cooking time and it turned out wonderful! Beth, do you think there was enough room in there to triple the recipe? Hi Amy – I don’t recall!!! Apologies but my memory is not the best. My guess would be yes bc that would be about 12 cups of liquid, right? First time making soup, very tasty thanks! I added kale instead of spinach , turned out great. Would you freeze without spinach and add that later? Thank you for sharing this recipe. I’m trying it for the first time and it smells delicious while it cooks in the Instant Pot (IP). I agree with you about the IP not being intuitive nor instant. It’s a great marketing ploy. Even so, I enjoy it. I recently received an I.P for Christmas 2017 and have been thinking about all the ways to use it before opening the box… I had thought of a similar recipe to yours, and started searching the internet for anything similar to get a rough idea of portions as the box is still closed… I found your recipe first and stopped searching… It is exactly the base I was looking for!!! I of course modified your recipe… One, I didn’t have celery on hand. Two, I really wanted to add coconut milk and butternut squash, and three, I only had frozen spinach and chicken stock…. I used 3 cups of chicken stock, 1 can of full fat coconut milk, ½ a small butternut squash. I added the steamed spinach at the end and it all turned out like stew… So I warmed up 2 more cups of chicken stock. It turned out perfect for my liking.. ok it was a little bland for me… But for my 5 and 3 year old it was perfect. They devoured their bowls and they aren’t the most adventurous kids in the eating department. Today is day one of leftovers and I swear the flavours have marinated more and it is an amazing soup! I know your recipe as is would be amazing. Thank you for sharing your experience and your delicious dish!!! It is going into my recipe box for sure!!! I love the addition of coconut milk! I, too, can’t help but adjust every new recipe I try. 😀 I hope you love your new Instant Pot! I really have grown to love mine and use it all the time. Thanks so much Anna! My second time making this soup, delicious! I used french green lentils this time around, using the same 12 min cook with aBout a 25 min natural release. ..perfectly cooked! Thanks for sharing. This recipe is going on the Favorite list. This will b3 my first try at something with lentils in it…..Can I use orange lentils…..is what I have in th3 cupboard right now. If they’re split red lentils, the result will be a lot different – more of a mushy texture. But probably still delicious! Made this recipe tonight. Added Italian sausage without the casing and diced sweet potatoes. 12 minute cook time, came out great. Thanks for the recipe! If I add potatoes to this would I need to add more time?? Hi Megan, I don’t think so. My only concern would be that they might actually be a bit mushy because they might cook too long. Please report back on how it goes! Is it 12 minutes manual on low or high pressure? 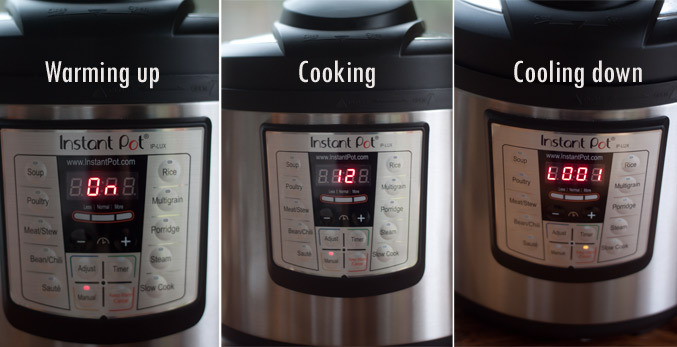 I haven’t tried this yet, but want to thank you for your comments about the “Instant Pot.” I bought one used and have been so confused about the instructions I thought maybe I had missed something, literally and figuratively. I also had realized that the cooking times in the recipe book included with it are misleading because they don’t include the warm-up time. I like it so far, but don’t think it’s nearly as great as other people seem to think. It’s nice to know it’s not just me. I look forward to trying this recipe! Oh it is SO not just you! 🙂 I hope you love the recipe. What a good jumping off point! Made this but *of course* there were alternations. A whole large yellow onion, 2 carrots, a parsnip, maybe 1.5 c celery, 4 toes of garlic, a large sweet red pepper, a can of fire-roasted diced tomatoes, 1+ tsp turmeric, 2+ tsp cumin, 1+ tsp a blend called Moroccan Spice I’d bought when delirious, a tsp of salt and some grindings of black pepper, four-ish cups of strong homemade chicken stock, three stems of fresh thyme. Out of brown lentils so used red ones. Insta-pot for 16 minutes, rapid release, added three cups of de-stemmed beet greens and stirred. Topped each bowl with a dollop of Greek yogurt and a teaspoon of a chimichurri-sh pesto I’d made. It was a warming sort of dal/vegetable porridge and we devoured it. Just bought my IP today and kicked off with this soup, and it is FANTASTIC. Thanks for sharing the recipe and your experiences using the pot. This was a great intro post. So glad you like the recipe! Enjoy your Instant Pot. I feel like I got a rocky start with mine but I love it now! This soup is a hit for our whole family including a 1 & 8 year old! Super easy to throw together and I freeze small portions for lunches. Love that the kids like it too! 🙂 Thank you Kelley! It’s delicious! My non vegetarian family loved it! I love your description and instructions for the IP! This would have been very helpful for the weeks I stared at it in fear before finally using it. 🙂 This sounds amazing. I’m going to try it this weekend! 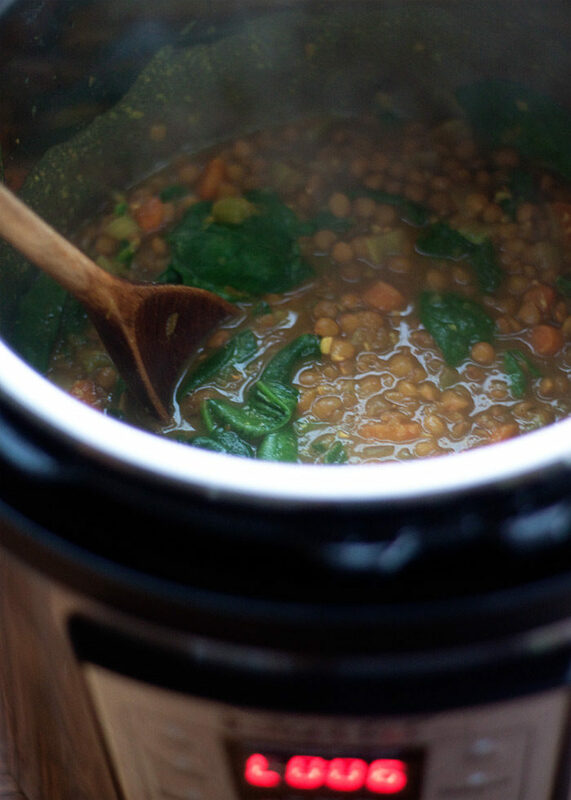 I’ve always made lentil soup with my slow cooker on low, which was always an overnight affair. I have a new IP, and looked for ideas from someone who made it successfully this way. Yours was the recipe I decided to try, and wow! Scrumptious Lentil Soup in about a half hour. Thanks for starting me off on making great soups!!! This is easily one of the best IP recipes I’ve ever made, and it’s become a huge favorite in our house. I have a bag of small lentils, can I sub them for the large? How would I adjust the cooking time? Hi Robyn! I’m so glad you like the recipe. It really depends on the type of lentil. 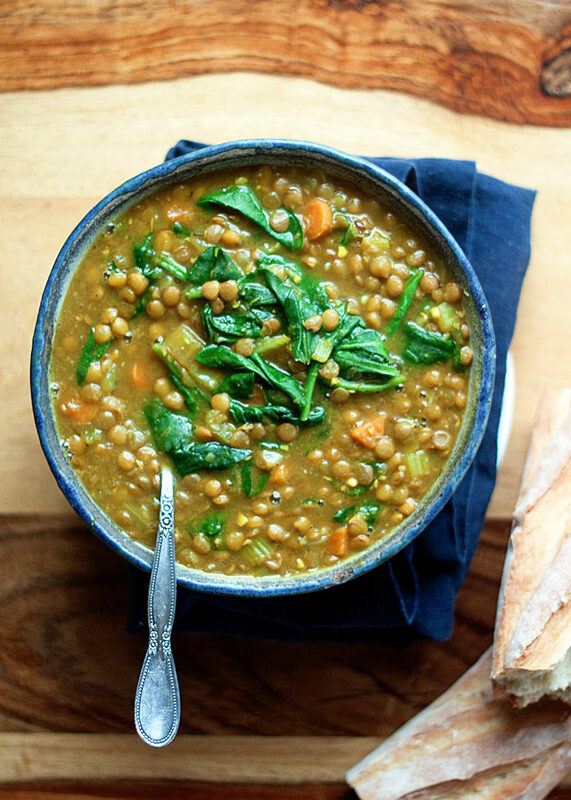 Split red lentils take hardly any time to cook at all; French Green take quite a bit more. Brown lentils are somewhere in the middle. If they’re much smaller, I’d maybe reduce the cooking time by a couple of minutes to start. It’s hard to ruin this soup so even if they’re a bit overcooked it should all be delicious. We had the GOLDEN LENTIL & SPINACH SOUP tonight and it was delicious. Next time I’ll be making a double batch. My husband had seconds. Thank you for a wonderful soup recipe. Thank you for the recipe! I halved the amount of salt and used regular (not French) green lentils instead of brown, and it was absolutely delicious – the whole family loved it. Easy to follow and easy to make. I only had green lentils but it turned out sooooo good I’m amazed by how quick, easy, and delish this is!!! Thanks for the recipe! 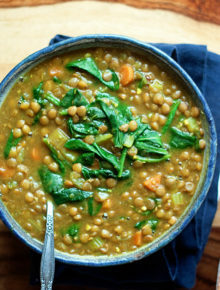 The lentil and spinach soup is to die for!! I did add a small a.ount of diced tomatoes as well as a little curry powder. So yummy.. Thank you. I am so happy to have discovered this recipe! It’s the first thing I ever made in my InstantPot! It’s so delicious that it has become a regular meal in my home. Perfect for evenings when you don’t want to spend too much time cooking, yet want something tasty and healthy. Well I’m honored this was the first recipe you made in your IP. 😀 I’m back to making this one for fall and I’m reminded how much I love it too! 🙂 Thanks so much for your review! This was the second recipe (ever) I made in my instant pot-TODAY. This was delicious and so easy to make. Thank you for sharing, I will be making this often. By far… my favorite recipe! Thank you!! I have green lentils and red lentils. Have you every replaced the brown lentils with others? This was very easy and very good. I only used 1 tsp of cumin, but that’s a personal taste thing. I’ve had my Insta Pot for almost 2 years and have just recently started using it frequently. I love it now. Was a tad scared of it before, so it made me leery of using much. I recently went plant based and the Insta Pot makes cooking beans so fast and easy. I can make hummus in one afternoon instead of 2 days. Thanks for the recipe. I’ll be sure to check out more of yours. Hi Pam! I’m so glad you liked the recipe. I was leery of the Instant Pot too! I still have to resist the urge to tell my daughter to stay out of the kitchen when it’s on, ha. 🙂 I’ll have to try hummus in the IP – sounds amazing! So easy to make and it turned out soooo good! Accompanied it with a simple green salad and toasted ciabatta bread. Delish! thank you!!! SO delicious! Even my non-vegetable-loving husband loved it! I didn’t have celery, but added more carrots. Great seasoning! This is the first recipe I’ve made in my instant pot. My 16 year old son gave it an 8/10! I really enjoyed it and will be making it again. Possibly for wrestling tournaments also! So good – thank you! I’m so glad you and your son like the recipe! 🙂 Thanks so much for the review. 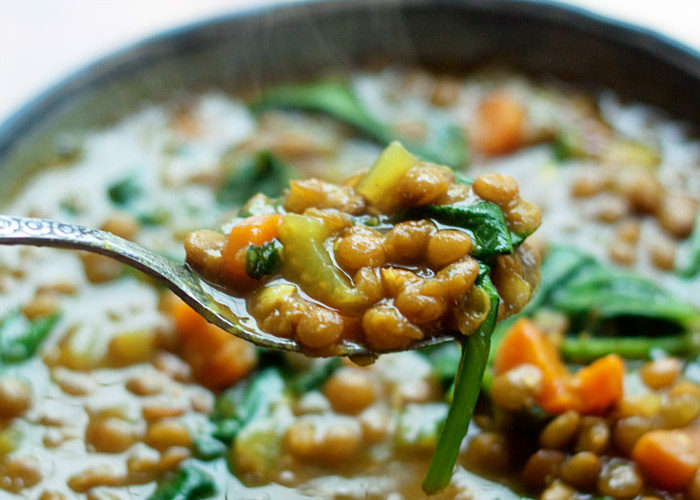 can you make it traditionally in a pot on the stove? I haven’t tried it that way yet, but I’m sure you can – I’d say it should take about 35-40 minutes? If you try it please report back! This was the best soup……so easy….so tasty. Hi! I am looking very forward to making this. It looks delicious and everyone seems to be raving about it. Quick question – can I use frozen spinach? If so, do I have to adjust the amount of spinach/cook time/when I add it? Just got an IP so I am planning on this being my first recipe. Thanks! I’ve not tried frozen spinach but it seems like it would work. I’d just thaw first and squeeze out any excess water then separate it the best you can before adding. If you do give a try please report back! 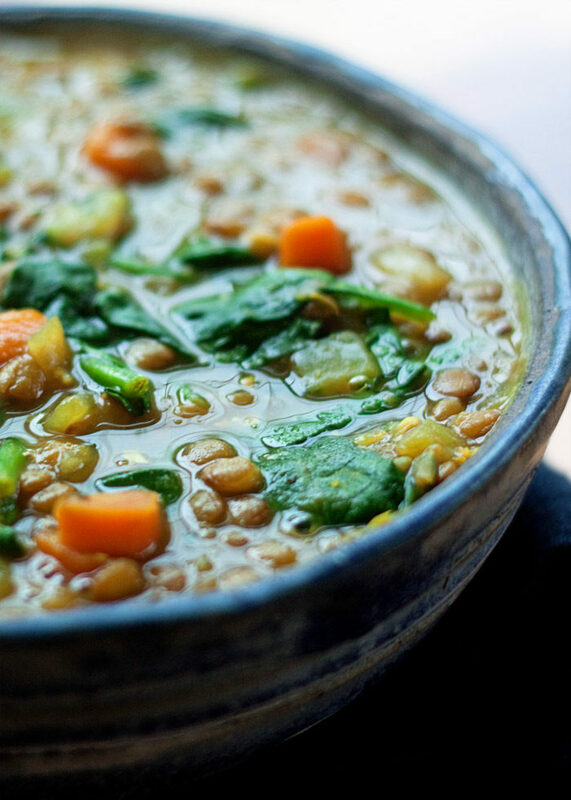 Perfect lentil soup – thank you! This stew sounds delicious, but how much does it actually make. I know it says serves 4. 8, 12 or 16-ounce servings? I haven’t measured recently, but I believe it’s about four 1 1/2 cup servings. SOOO good! My first recipe after months of side-eyeing my instant pot mini! Just wanted to thank you for your wonderful recipe. Had our first snowfall yesterday in NYC and I was so cozy at home making this soup. It turned out really delicious and so satisfying! Added a dollop of greek yogurt on top…YUM. Thank you again! Look forward to following more of your recipes in the future. Hey! So I tried making it and when I went to open the instant pot the lentils absorbs all of the liquid!! 😩 idk why that happened! Did the Instant Pot seal? I’ve had this happen. I’ve forgotten to make sure my handle is in the “seal” position, or I’ve needed to clean the sealing ring, lid area, float valve, and anti-block shield. Usually one of those things is the culprit. I would like to try this recipe for a dinner party I’m throwing. I don’t have an Instant pot. Can I make this on the stovetop and if so, how would I alter the cooking time/recipe? Thank you! 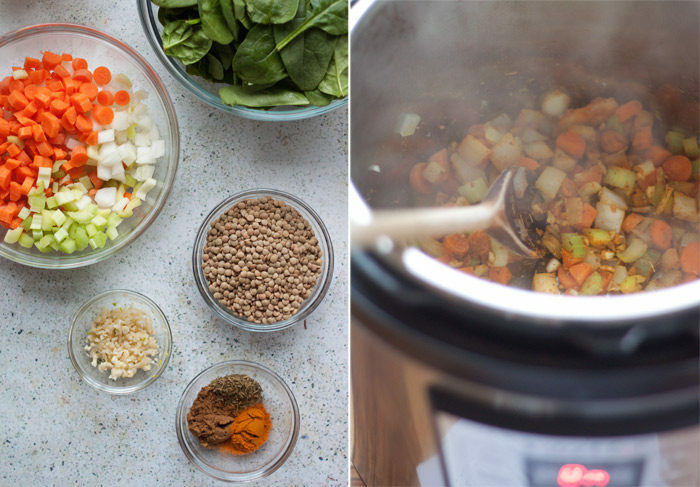 Are you using a 3 quart instant pot or 6 quart? Hi Andre, I have a 6-quart.